There are times when life takes precedence over blogging and I’m lagging behind a little with my postings as a result, only by a week or so, but at this time of year when nature is pressing on apace, an awful lot can happen in a very short time, so I’m trying to catch up. The hot weekend of 25-26th March brought the incentive I needed to finally get out and cut the grass for the first time this year before its height exceeded the capabilities of my daughter’s little Flymo. 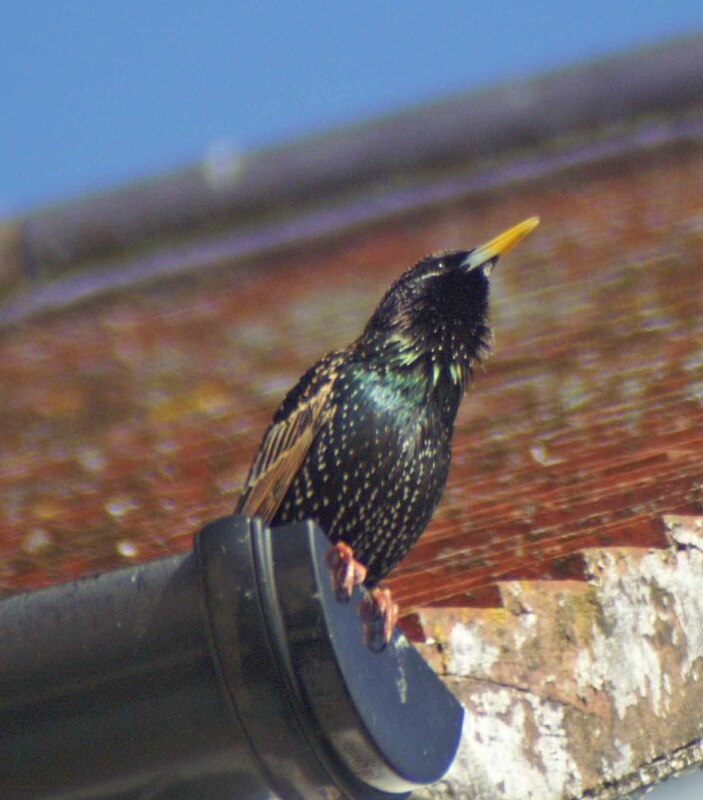 My antics attracted the curiosity of a few of the neighbours, who peered down from their penthouses to see what the racket was about. 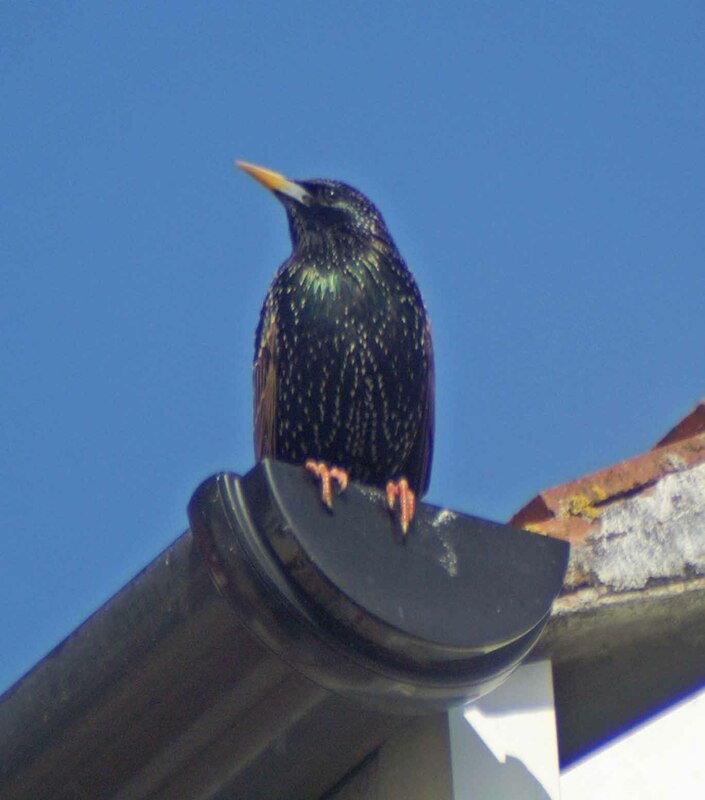 The starling, recognisable as a male by the blue base to his bill, looked so gorgeous I am putting in another shot of him. 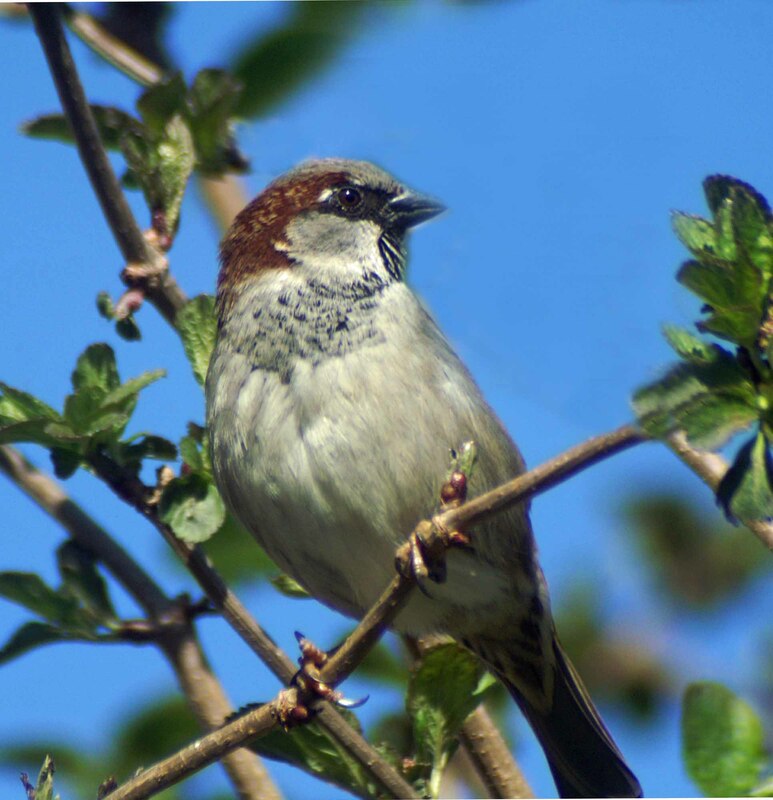 The garden hedges were bursting with House Sparrows, and I can see that at least two pairs are beginning to nest within the spiny pyracantha; more are occupying a space they have found high up in the eaves of the house at the front. 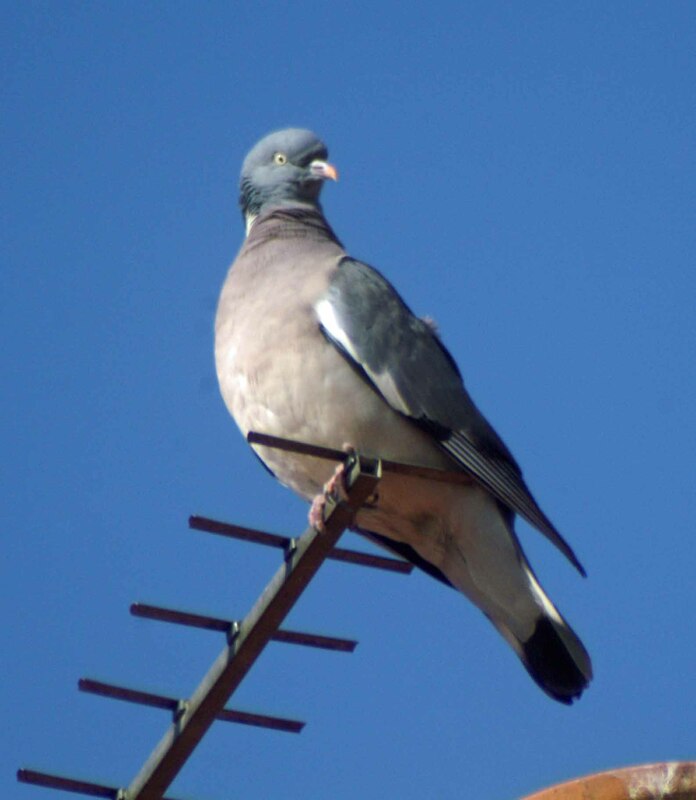 Their constant cheerful cheepings and chatterings ensure I am aware of their companionship. They may not be colourful, nor can they sing, but I love them. 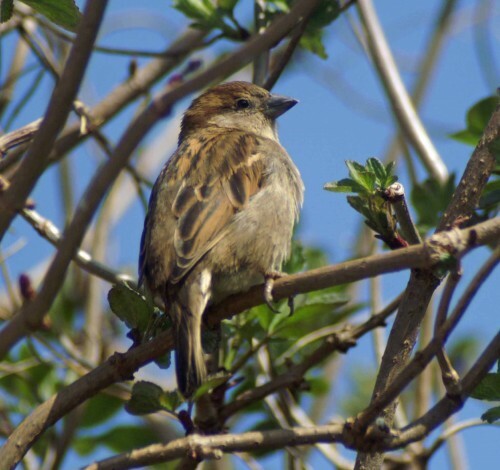 They may be brown, but how can you not appreciate the subtlety and detailed patterning of a female Sparrow's wing? I’ve never been a fan of closely mown and weed-free lawns, partly because I never had the time or the inclination to spend hours on nurturing such a sward, but mainly because I could never bring myself to mow down daisies and would always leave little archipelagos of them strung throughout mine. I have a slightly different attitude to dandelions; whilst I do appreciate their golden beauty, they go to seed so rapidly and spread like wildfire so although I will leave a few, the majority do have to go. They are a very important source of nectar for early pollen and nectar foraging insects though, so I’m not too hasty to give them the chop. 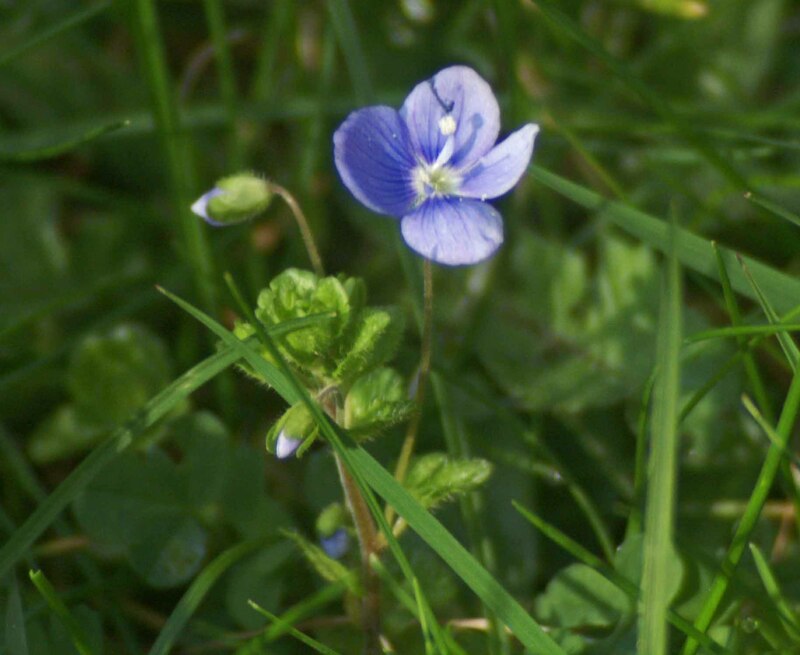 Dainty blue speedwell is another wild flower I hate to cut down. They don't take up much space and are so pretty. There are a couple of patches of lesser celandine in the lawn in this little garden that I am loathe to cut , even though I know they are just going to continue to grow and spread and probably get out of hand, but whilst I’m care-taking here they’ll stay. I was gratified to see a small hoverfly on a flower and delighted by a visit from one of my all-time favourite insects, a crazily-constructed bee-fly. A very distinctive fly, a bee-mimic, these fascinating insects are most frequently seen in the early spring, from April to June when they may attract attention as they hover for several seconds at a time in the same spot, either over bare ground or over a flower then dart off and return to the spot facing in a different direction. Their hovering may be accompanied by a high-pitched buzz. 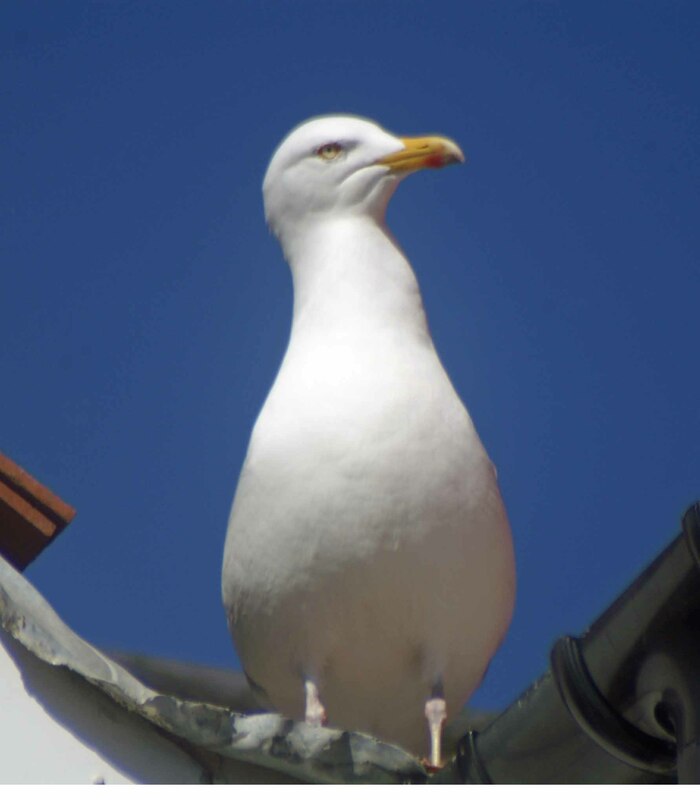 The body is rounded and furry, the legs appear disproportionately long and spindly, but are probably required to balance the long rigid proboscis which is permanently fixed on the front of the head. Their boldly patterned wings have a distinct dividing border through the horizontal middle between the dark and clear portions. Their antennae are typically very short and pointed. 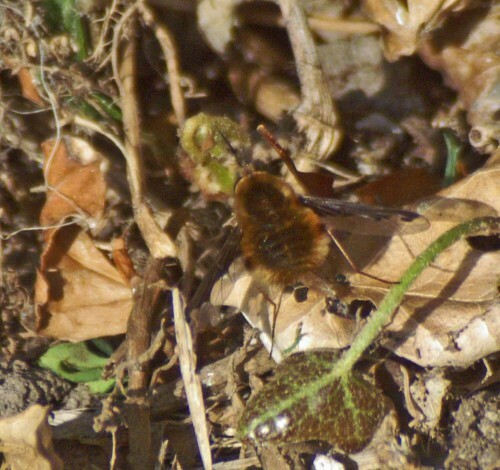 The bee-fly’s behaviour belies its cute appearance though. The adult female lays her eggs close to the underground nest of a solitary bee 0r wasps, then flicks them towards the entrance. 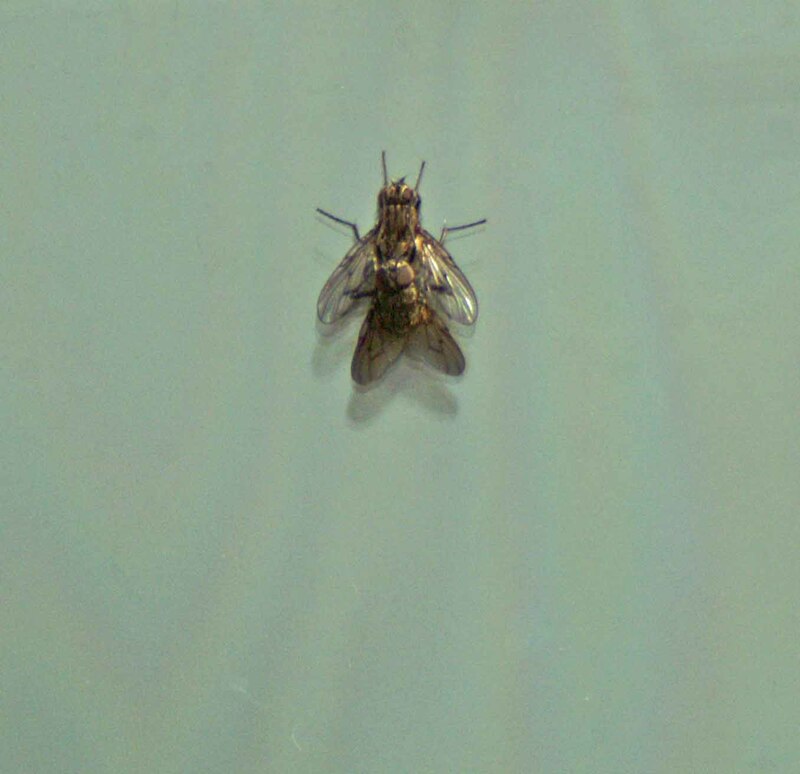 After hatching, the bee-fly larvae find their way into the nests to feed on the nest owner’s larvae. 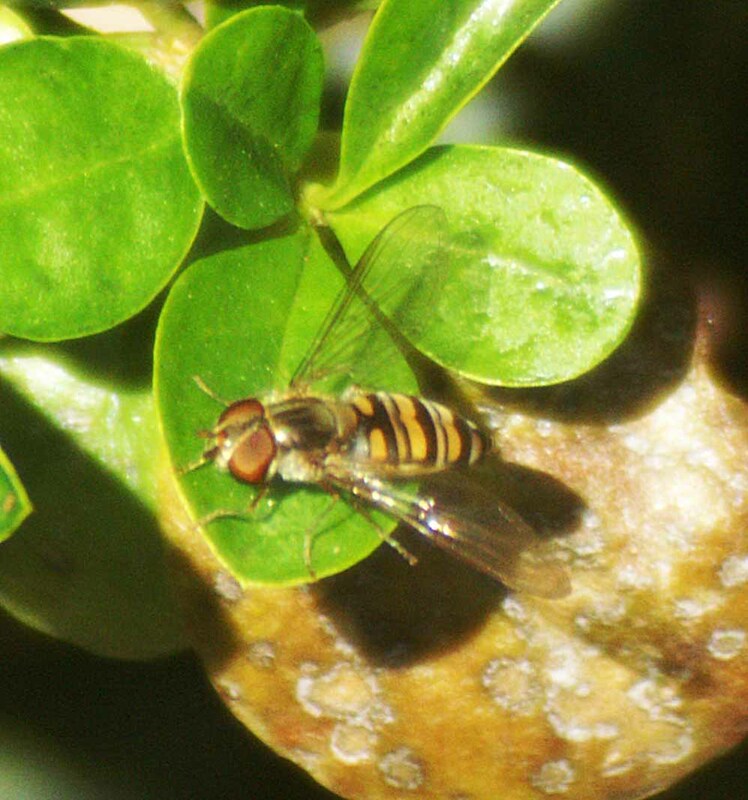 There were lots of drone flies about and a lesser number of smaller species hoverflies. Surprisingly my first butterfly sighting of this year was a little Holly Blue, followed a while later by the species I had expected to see first, a Speckled Wood. Neither obliged by resting for long enough for me to photograph and it feels like cheating to use ‘one I made earlier’, so I’ll have to wait. 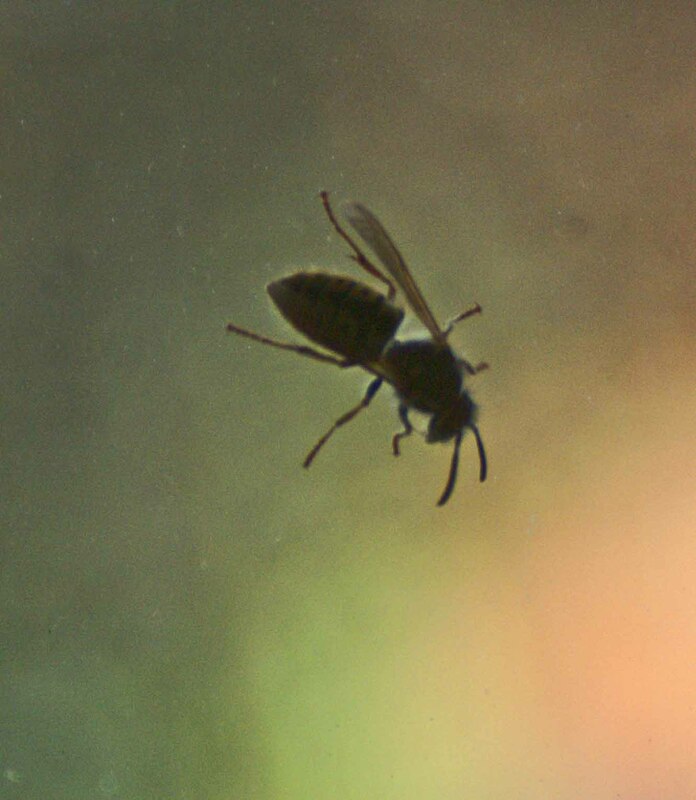 Inside the house, a large queen wasp had become trapped against the kitchen window: I had watched it earlier flying back and forth along the bottom of the hedge. After taking the photograph I let it out. Must clean that window. 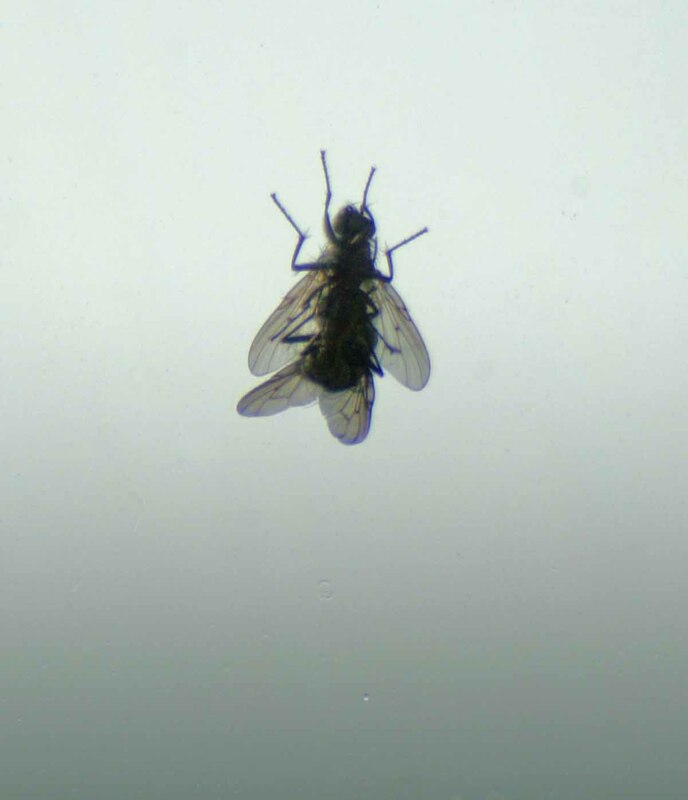 The upperside view of the flies on the outside of the window. Difference in size between the sexes is appreciable, the male considerably smaller. 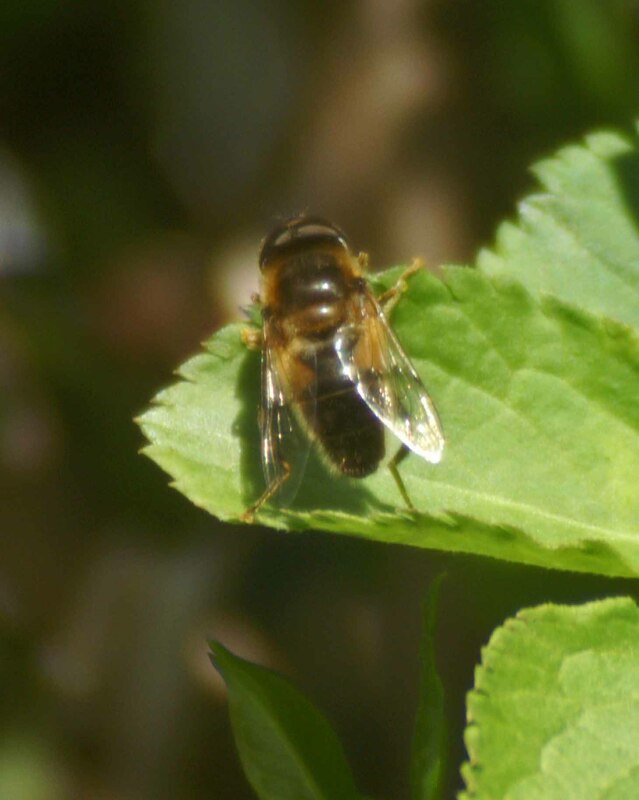 Sitting in the garden on Sunday afternoon, I was ‘buzzed’ a couple of times by bee-flies – fascinating, they seemed to be watching me, watching them. Marvellous the way they hold their position. Lovely post, thank you. Thank you for your comments. I think the bee-flies are quite territorial, I noticed a few times that hovering individuals dislodged others that were resting on the hedge leaves nearby, so perhaps they thought you were in their space! Some excellent images there, Theresa. I too came across some Bee flies recently and in more than one part of the country. Thank you Tony, I’ve been lucky with the photo opportunities I’ve had recently. There seems to have been a bit of a bee-fly population explosion this spring; I have seen more individuals in the past couple of weeks than ever before. I hope that hasn’t impacted too much on the bees and wasps they parasitise. 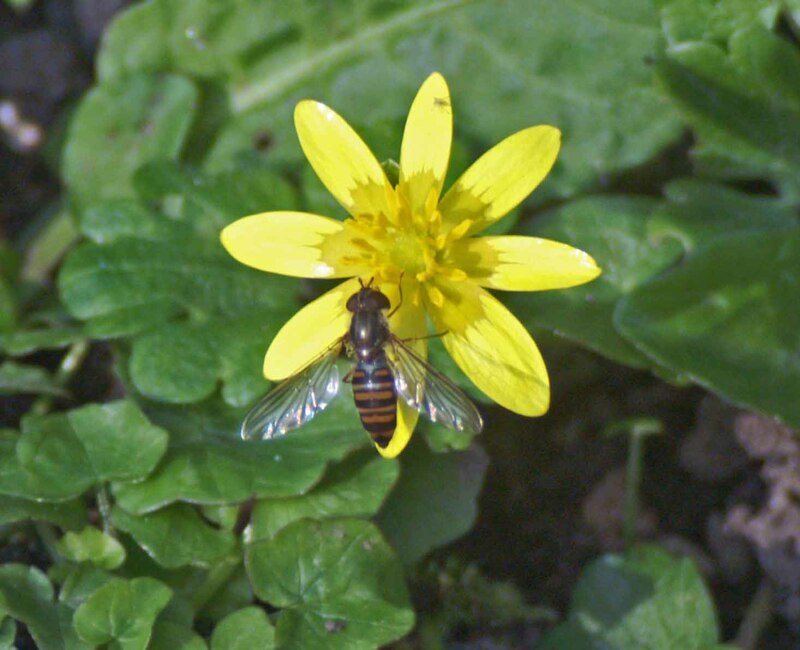 Great shot of the hoverfly on the lesser celandine. And I love your bee fly too. I spent an hour in the sunshine on Sunday trying to photograph bee flies in flight and I got a couple of interesting pictures, they’re tricky little things to capture though! Thanks Finn, I love to get double value in an image, particularly flowers with insects – I’m still trying to id that hoverfly though. The bee-flies are challenging to capture aren’t they? I think I may have benefited from better light; looking forward to seeing your images, I took more this past weekend too. 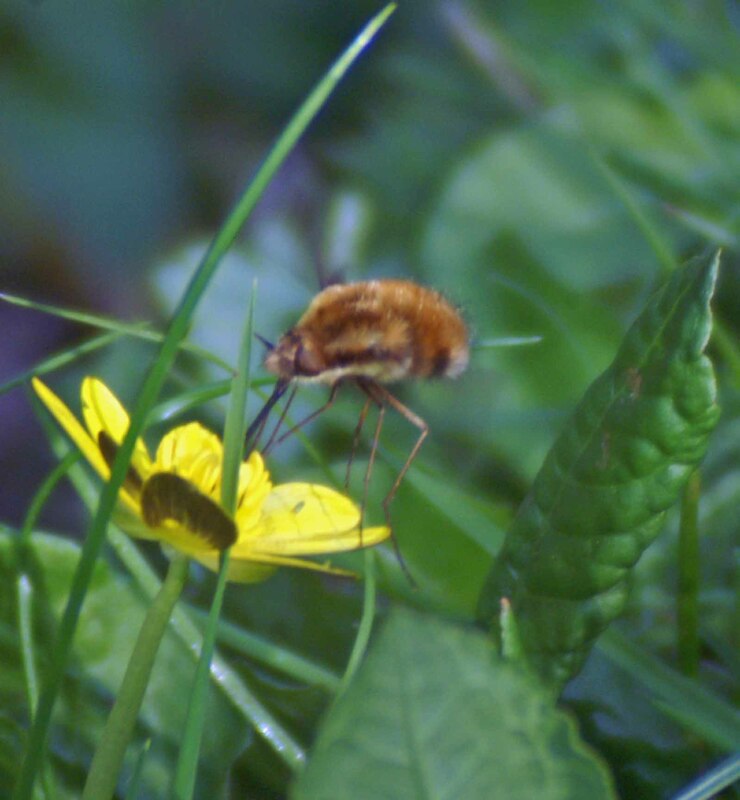 Great photos of the bee-fly. I agree with you about lawns. Thank you Emily, they are such unique little insects I can’t resist photographing them – it’s such a shame they exist at the expense of other bees and wasps though. I’m glad to know I’m not alone with my weedy lawn!